Martin Wallace’sÂ Essen release is an economic game set in industrial revolution Lancashire. Players take the roles of entrepreneurs attempting to make the most money from the various industries of the time. The rules have just been posted to the Warfrog website and you can take a look at them here. The winners of the 2007 International Gamers Awards have just been announced. In the multiplayer category, the award went to Through The Ages, designed by Vladimir Chvatil and published by Czech Board Games. The two-player award went to Mr Jack, a game by Bruno Cathala and Ludovic Maublanc, and released by Hurrican Games. Both are very good games, although neither would be my choice. We’ve only played the introductory version of TtA so I may see the light when I get to try the Advanced and Full games. My current choice of the games nominated would have been torn between Notre Dame and Pillars of the Earth for the multiplayer award and Medici vs. Strozzi in the two player. 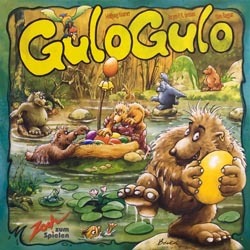 Persuaded everyone to play a game last night and chose Gulo Gulo, which only Chris has played before. It is a fun game for the family, typical of Zoch, and demonstrates the genius of Wolgang Kramer yet again. Those with fat fingers (i.e. me) are at a bit of a disadvantage and more likely to trigger the alarm butÂ it is quick with cute wolverine pieces. Jan showed us all how to play and beat us to grab the purple eggs. 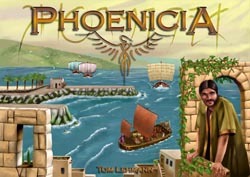 Phoenicia is a game I first tried at the first UK Expo in Birmingham this year at the JKLM stall. I thought at the time it was a good game and one that needed a number of plays as there was a number of options available in the game play to victory. I had the opportunity to play it again on Friday. The game revolves around two concepts, one is obtaining victory points and the other is improving your production. (which is in effect your wealth) There are two ways of increasing both of these things, the first is the more mundane way and involves training and using workers, either in an hunting capacity or in a farming capacity, this gives you a steady increase in VP’s and in production. The other way is in the purchase of development cards in the auction phase. These cards are bought as either short term VP and production gains or as long term investments that gain you better options on the superior production cards that can be bought later on. The purchase of the better development cards later in the game is I believe the key to winning, the boost in VP’s gained from the later cards cannot be easily matched by workers alone. As usual with these sort of games money is tight and achieving a balance between when to upgrade and train new workers and the purchase of development cards is tricky to judge correctly. In the initial stages of the game, I first of all trained a worker and set him to work in the field as a farmer and then got a bit lucky the following turn by getting a ‘6’ card which allowed me to get a fort development card (with it’s 3 untrained new workers) this good start along with the prior knowledge of leaving the glass making development card (a short term gain) well alone just gave me an earlier edge. The game progressed as normal with players deciding on following one strategy or another, me and Nige (or the special one, as he is known) both decided on the city centre (2VP”s) – public works (5VP’s) – city walls (8VP’s) route and it came down to a fight for the third public works card which I took with a bid of 28! I gambled on paying all my money for this one card, immediately after getting it I thought I’d paid too much as I was unable to improve my production and that would leave me short of cash. It did however give me sufficient VP’s to put me within site of the finish line of 32VP’s. My next turn was consolidating my finances with some prudent worker upgrading and the first purchase of a VP (thanks to the city centre card ability) The last turn threw up not one but two city walls. I bid on the first and was beaten by a bid of 32, I could have bid as high as 34 with my 7 point deduction for having two public works, but I feigned not having the cash, the other city walls I then bid on and fortunately the remaining players really wanted the fleet and port cards as they had discounts due to buying the shipyard card, so they didn’t really want city walls. I was able to purchase the second city walls for the minimum 30 which gave me sufficient money to buy one more VP and win the game with 35pts. The scores were close in the end and for one minute I thought Garry might be able to buy both the port and fleet cards to tie on 35 with me, but Mark G who’s production was very good has sufficient funds to prevent this. Ratings were 8 out of 10 from (I think) everyone and hopefully a game that will be played again sooner rather than later. Just a reminder that this weekâ€™s session of the Shrewsbury Boardgames Club on FridayÂ 21st September is at Garryâ€™s house. Ystari have published the rules to their new game coming out at Essen, Amyitis. The game is about the building of the Hanging Gardens of Babylon, which Nebuchadnezzar, the king of Babylon, builds for his queen, Amyitis. Having skimmed through the rules, I am really looking forward to this one. I think that Ystari have another hit on their hands – they don’t seem to have put a foot wrong so far: Ys, Caylus, Mykerinos, Yspahan and Caylus Magna Carta represent a fine set of games. The Amyitis homepage is here. 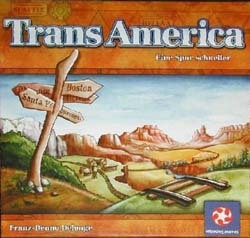 This week, I decided we should start with a quick game of TransAmerica to pay tribute to the designer, Franz-Benno Delonge, who passed away on Sunday. This is a great game to introduce to new gamers with simple rules and quick gameplay and I always enjoy it when I play it. Now Steve admitted that he has played dozens of games on Brettspielwelt so he was hot favourite and confirmed this when he was first to link up his cities in the first round. Mark K somehow found himself 6 spaces short so not a good start for him. The second round saw me connect up first with Steve drawing level with me. Things stayed pretty tight between me and Steve until the last round when I knew from my starting cards that I was going to struggle and sure enough I ended up 5 spaces short, allowing Steve to claim the win. It must be admitted though that he did play an efficient game and all his practice paid off. Note to self: Check which games Steveâ€™s playing on BSW before choosing the nightâ€™s games in future! 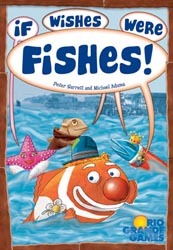 We then decided to try the new game by Peter Sarrett and Michael Adams: If Wishes Were Fishes published by Rio Grande. The players are fishermen trying to catch fish and sell them for a profit at market. However, when you catch a fish, you have the option of throwing it back in return for it granting you a wish â€“ hence the title. Players start off with two boats each of which will hold a fish. On your turn you can choose between three options: First you can catch a fish and load it onto your boat. You choose one of the four available fish in the sea and pay for it depending on how far offshore it is â€“ the shallowest water costs you nothing but each step further out costs you one of your limited supply of worms. Instead of loading a fish onto your boat, the second option is to toss it back and carry out the wish offered by the fish. There are numerous wishes that allow players to move the buyers around the markets, sell fish, collect money based on the worms they possess, acquire a new boat, etc. The third option is to sell a single fish from one of your boats at one of the seven markets. These pay $2 per fish plus a bonus if any of the buyers are at that market. Once a market has a given number of fish in it (initially 4 but rising to 7), it is declared full and the players with the most and second most fish sold there get a bonus. Any further fish sold to that market get sent to the garbage heap. Once four markets have been closed, the game ends. Alternatively, if ten fish appear in the garbage heap, that ends the game early and those with the most spoiled fish receive a penalty. Either way, bonuses are then added for those with the most worms left and whoever then has the most cash wins. Our game stayed pretty tight but I always felt I was playing catch up. Despite running out of worms, which limited me to fishing in the shallows, I still managed to be near enough to the leader. However, the timing of the when the wishes with worm bonuses attached was pretty critical. Steve and Mark K especially benefited from bonuses in double figures from these very lucrative wishes. The end game condition was touch and go as to whether it would be due to garbage or a fourth market closure. The garbage route would have hit Mark K and Steve, who were leading, but it wouldnâ€™t have changed the result and a fourth market close engineered by Mark G improved both his and my scores. However, Mark Kâ€™s worm bonus gave him a comfortable margin over Steve in second. I think we felt this was a reasonably good game even though it didnâ€™t set the world alight. The choices to be made were fairly obvious and there didnâ€™t appear too much opportunity to set yourself up for a major score. However, the game played nicely and it would be good in a family environment. We finished off with a perennial favourite, 6 Nimmt, which is always good fun and does involve lots of angst in picking cards to avoid taking penalties. As usual, when people picked up their hands, everyone declared what bad cards they had. In the first round, Nige followed up on such a claim by taking a whopping 32 penalty points. Mark G ended the round with just one penalty point but made up for it in the remaining three with 25, 20 and 30 points respectively. Steve remained in contention with me quite well in the first two rounds but then got 19 points in each of rounds three and four. Mark Kâ€™s game came good at the end taking no penalties from the last hand but after three bad rounds previously. Yours truly proved what a fine judge he is of 6 Nimmt though, taking just 18 points over all four rounds for a fine win. 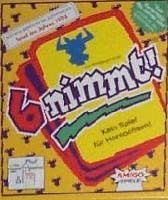 6 Nimmt is a classic card game which I am always happy to play. It is one of those really good examples of being able to use the odds to determine the best card to play, although it doesnâ€™t always work, and judging when to take the pain for minimum loss. Great stuff. Full results and ratings are posted on my Trickylight website. The new game from Fragor Games, Antler Island, has a preview video on YouTube. I have this pre-ordered, ready to pick from Fraser and Gordon at Essen. Author Garry LloydPosted on 6th September 2007 6th September 2007 Categories SnippetsLeave a comment on Antler Island: Coming soon! I was saddened to hear of the death on Sunday of designer Franz-Benno Delonge, due to cancer. He was just age 50. I’ve played several of his games and enjoyed most of those I’ve tried. From the two player games, Hellas and Fjords, through Goldbrau, Dos Rios and Big City, to the excellent Manila and especially Transamerica, he has provided us with hours of enjoyment. He was preparing for the release of a new game at Essen, Container, which I’m certain to have a good look at while I’m at the fair. Maybe we’ll dig out Transamerica on Friday as a tribute.